Instrumentation: Sangamo state of charge meter #129985 and chalk marked with this number on back of instrument panel (as with Pugh's Milburn). Meter runs backwards during charge. Even has a battery charge efficiency tap for lead acid or nickel iron. Stewart Speedometer date code stamped "L7" indicating made in July 1919. Charger: Original is a 110V AC motor stacked on a DC motor with current level switch; Primary charger used today is a home-made 2-stage charger made from Vicor Megapac unit and several DC-DC converter modules. Owner's remarks: The Car was purchased by Lee Oldfield in 1934 (no relation to Barney Oldfield but a AAA contest board member for the Indy 500, He entered a rather advanced 16 cylinder mid engine race car in 1936 but didn’t qualify). Lee kept it stored, unused (IL Lic#844251) until 1950 when he sold it to Milton McFadden of Burbank, Ca for $102.75 plus $75 for the charger. The McFaddens kept the car until Milton passed away in 1997, when Eric Leubben of Ca. bought it (car had Ca. Lic# HC7400). In 2005, the car was bought by Myles Twete of Portland, Or. (now has Lic# AQ02968). Analysis 10/08/09: From 1950 (or before?) 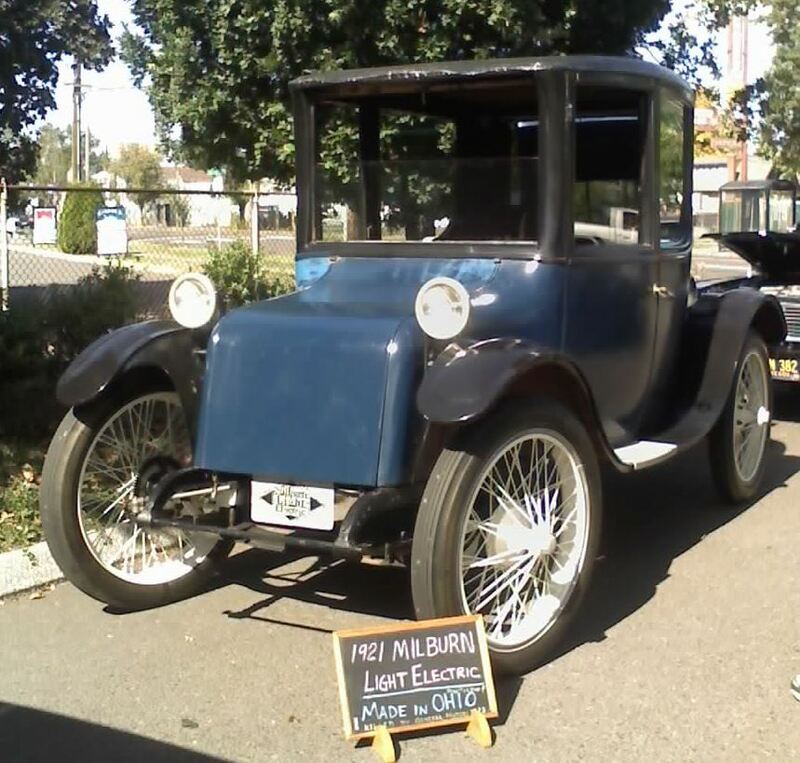 thru 2006, this car was registered as a 1917 Model 27L Milburn. Mr. Oldfield indicated in a letter to Mr. McFadden that the car was a 1917, so presumably in 1934 when Mr. Oldfield purchased the car he was told it was a 1917. In early 2006, based on discussions with others regarding Milburn S/N's, it was concluded that this 2-1818-7 Model 27L could not be a 1917 since (1) the S/N is a Model 27L#, (2) Model 27L's didn't begin production until late 1918 for delivery in 1919, (3) Original speedometer with Date code of "L7" indicating July 1919. At the time, in 2006, our best guess was that this car should be considered as a 1921 Model 27L. However, based on the above, the vehicle was most likely built in late 1919 or 1920 and should be considered a 1920 Model 27L. I would be very interested to know the pre-1934 history of this vehicle. Update 04/14/2015: SAE Journal, v20, 1927 indicates "A short discussion followed in which W. Martins of the Fashion Auto Station and Lee W. Oldfield (consulting engineer in charge of design and development, Pac-Age Kar Corporation) took part". This connects Lee Oldfield to a well known Chicago electric vehicle charging garage and Milburn dealership. This is also one of the later references to the Fashion Auto Station and well after its Milburn dealership days.